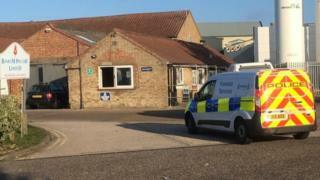 A worker has suffered electrical burns after an incident at a poultry factory in Norfolk. Fire and ambulance crews were called to Banham Poultry, in Station Road, Attleborough at about 13:30 GMT. The victim was airlifted to the specialist burns unit at Broomfield Hospital in Chelmsford, Essex. No further details have been released. Norfolk Police said the Health and Safety Executive had begun an investigation. Banham Poultry has been approached for comment. The news comes five months after two subcontractors working for a pest control company were found dead near the factory after a suspected refrigeration gas leak. Banham Poultry has been based at Attleborough since 1965 and is one of the area's biggest employers. In October, the company was put up for sale after reporting debts in excess of £40m. Derbyshire-based Chesterfield Poultry secured the factory's future - and 1,000 jobs - after beating a rival bid from turkey producer Bernard Matthews.